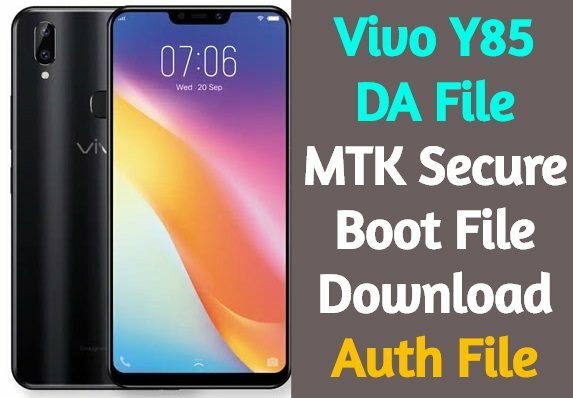 Vivo Y85 MTK secure boot files is here to download. Getting error in Vivo Y85 frp bypass or firmware flashing due to “Da File MisMatch error” or “Authentication error” or “Buffer error: etc then you have to download Vivo Y85 DA File. Vivo Y85 is a MediaTek [ MTK] chipset based android Oreo 8.x.x smartphone and comes with MediaTek MT6737 processor. So user can use any scatter firmware flashing tool like NCK tool, Miracle tool or Sp flash too etc. But problem is that Vivo Y85 is the latest MTK smartphone and comes with secure boot feature. Just because of this secure boot feature it’s show the DA file error during the flashing or frp bypass process. To resolve this issue, you have to load new Vivo Y85 DA File in “DA File” section and then continue the process. A Vivo Y85 Download Agent Loader file is a key to access the internal storage for the device. Whenever you want to install a custom ROM, make a backup of your device, Flash IMG files, unlocking bootloader etc. You will need these Download Agent files. Without Download Agent files, you won’t be able to read or alter the files present in the secure storage fo the chip. Many Vivo Y85 MTK devices are now coming with a secure boot system. This system doesn’t allow any DA file to access the internal contents of the chip. So to bypass this secure boot lock, we need to use a special type of Secure Boot DA files. These files will allow us to access the internal storage of the device. So that we can alter it according to our will. In order to do that, we need to use a Secure Boot Download Agent Loader files. A Download Agent (DA) enables your favorite Mediatek Flash Tool to read and write to the device. In a case where the default DA can’t, you’ll encounter constant errors or the phone just powering up when you connect (this dates as far back as the Vivo Y85). This is where a custom DA file comes in. Depending on the tool you’re using, you manually load the custom DA ( DA_PL.bin or Authfile.auth ) . These are some of the commonly used functions of the Boot DA files. You can do so much more than these. For. eg. cloning a recovery image, cloning boot files, taking a backup etc. All of these can be done with the help of a secure DA boot file agent. How to Use MTK Secure Boot DA file? It is simple to use these new Custom Secure Boot DA files if you are already familiar with using normal/default DA files. Please note that these secure boot DA files are tool specific, i.e. they will only work with specific MediaTek tools. In this article, we will be giving a detailed explanation on three tools: Sp flash tool, Miracle Box, CM2 box. So, guys, this is how you can use Vivo Y85 Secure DA files using multiple MTK tools. Please note that some of these Secure DA files only work with specific MTK tools. Also, these instructions are only to select the DA file using different MTK tools. If you want to do a specific task such as FRP Unlock, Root, Installing custom recovery etc. Then you might have to look another article. Thanks for reading and have a wonderful day.